Click here for data sheet..
AThis product offers a complete power conversion system between batteries and AC power. It can provide backup power, sell power back to the utility grid, or provide complete stand-alone off-grid service. NOTE: The system is packaged in 6 boxes, and you will have to put it together yourself. It is quite simple, if you follow the instructions! The Load Center is pre-wired by factory for easy installation. If you have any questions, please feel free to contact the seller! The Radian Series Inverter/Charger is intended for both grid-interactive and off-grid applications. These inverters are designed to use a battery bank to store energy. They can work in conjunction with photovoltaic (PV) panels to harvest solar energy, as well as wind turbines and other renewable sources. These sources charge the battery, which in turn is used by the inverter. The Radian inverter has six modes of operation. Each mode has functions and priorities that are intended for a designated application. Each of the Radian’s two AC inputs can be set to a different operating mode, so that different applications can be supported. battery power to the AC source to ensure that the loads receive the power they require. the loads do not use all the excess energy, then the Radian will return that energy to the utility grid. occurs the transfer speed will be less than 4 milliseconds. inverter will supply energy to the loads from the battery bank until the power is back online. The Radian Series Inverter/Charger cannot connect directly to photovoltaic arrays, wind turbines, or other renewable sources. The batteries are the inverter’s primary source of power. However, if these sources are used to charge the batteries, the inverter can use their energy by drawing it from the batteries. overcharging. OutBack Power’s FLEXmax charge controllers can be used for this purpose, as can other products. 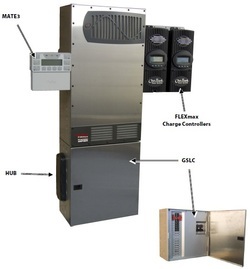 The GSLC will facilitate the mechanical and electrical connections for up to two FLEXmax charge controllers. Grid-Interactive and Stand-alone capability in the same package• 8000 Watts of continuous power• Unsurpassed surge capacity• 120/240V split-phase voltage• Dual AC inputs• Field upgradeable firmware• Field serviceable modular design• Simplified parallel design allows easy installation of systems from 8 to 80kW• GS Load Center option allows for quick and easy installationThe new OutBack Power Technologies Radian Series GS8048 inverter/charger provides a comprehensive answer for grid-interactive and stand-alone power systems. Based upon a proven foundation of reliable technology, but engineered from the ground up to simplify the design, distribution, installation and implementation of energy storage, the standardized structure and integration with the GS Load Center make it easy to provide a successful solution to any power requirement, anywhere. Unique dual power module design provides high efficiency at both low and full power operation, while providing redundancy for critical applications. The modular design also allows easy field servicing of installed systems. Complete system interface using the OutBack MATE3 and HUB Communications Manager enables the Radian Series GS8048 to be connected with other OutBack Power electronics providing industry leading integration and a robust, scalable power solution. Up to 10 units can be connected in parallel for systems up to 80kW continuous power output. The Radian Series utilizes a durable stainless steel face with galvanized steel enclosure, providing you with OutBack’s signature ruggedness but with a sleek, compact and modern appearance. OutBack Power inverter/chargers are the only choice when you need a dependable power solution for your home or business.